If you're looking for a good learning tool that explains the effect of different parameters on an HPLC separation then it might be worth taking a look at HPLC Simulator. 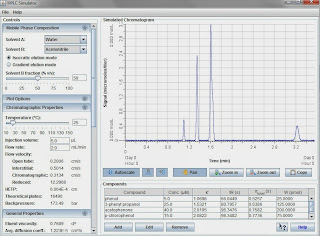 "HPLC Simulator is a web-based high-performance liquid chromatography simulation. Adjust a range of experimental parameters and see their affect on chromatographic parameters including retention time, column efficiency, and backpressure. It is intended to be used for educational purposes only." An important step in the transfer of an analytical method to another laboratory is the review of the method prior to transfer. This assessment of the method should identify whether it is suitable for transfer and if any potential problems that may arise when the method is run in a different laboratory can be anticipated. This review process is a major topic in the MTS course, Transfer of Analytical Methods for Pharmaceutical Analysis, and an aide mémoire to assist this review has now been developed based on the training course, which can be downloaded for free from the MTS website. The intention of the aide mémoire is to suggest common issues and problems to look out for during transfer. 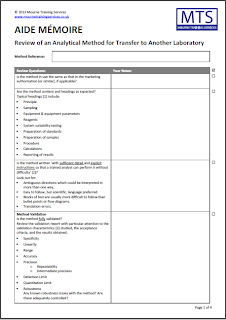 I've deliberately called it an 'aide mémoire' rather than a 'checklist' because I think that the term is a better description of the free tool in that it should help to anticipate common issues but is not intended as an exhaustive and complete list. The aide mémoire is a document in progress, I will add to it from time to time based on feedback from the training courses that I deliver. If you have any ideas about what you think should be included then please send your suggestions to me using our Contact Us page.